Communities@Work embarked on a vision of engaging children with nature based learning through outdoor playgroups over ten months ago. The key goals of the project were to engage children and educators in nature based learning through play. 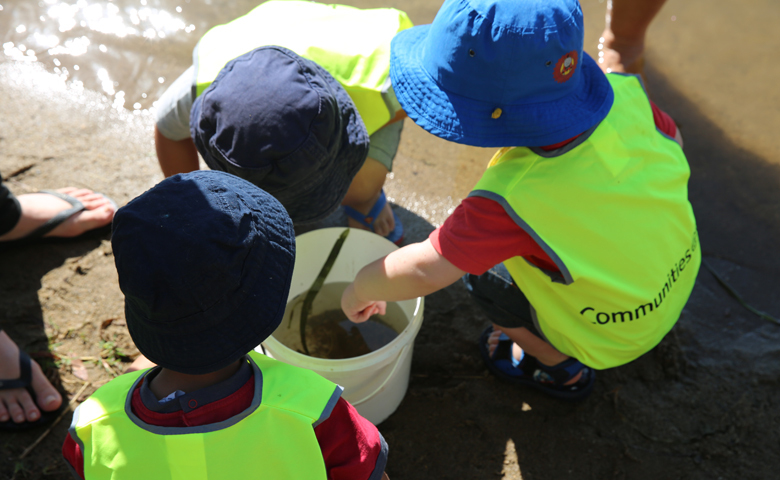 Our outdoor playgroups operate once a week at various locations across the ACT and are attended by Communities@Work Family Day Care educators and children who access this service. Over the past ten months, the children and educators have made some ground around Canberra’s popular outdoor destinations. Some of the favourite locations so far include Tinbinilla, Jerrabomberra Wetlands, Lake Ginninderra and Mount Taylor. We have been very fortunate to have partnered with Grass Roots Environmental, and supported through a community grant from Real Needs Insurance. This has allowed for local community agencies to engage in this project such as Greening Australia and ACT Park Rangers. We have also collaborated with Erindale Community Neighborhood Gardens to create a bush tucker garden for the local community to enjoy. Check the adorable video of the popular outdoor playgroup at the Lake Ginninderra and if you would like to find out how you can get involved in our outdoor playgroups, visit our Family Day Care page and get in touch with us.